The U.S. Air Force (USAF) delivers global satellite communications (SATCOM) capabilities that are foundational to joint warfighter operations across the range of military operations, and will only become more critical in preparation for the battlespace of the future. Force lifts off from Space Launch Complex-37 at 8:26 p.m. ET, March 15. 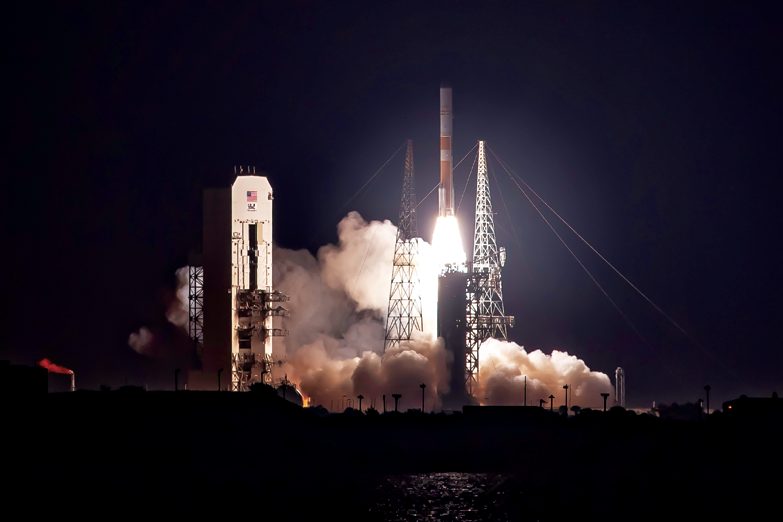 Photo is courtesy of United Launch Alliance. With potential adversaries continually seeking to deny, degrade and destroy U.S. asymmetric advantages in space, the USAF is evolving SATCOM capabilities for the nation’s warfighters and strategic allied partners. 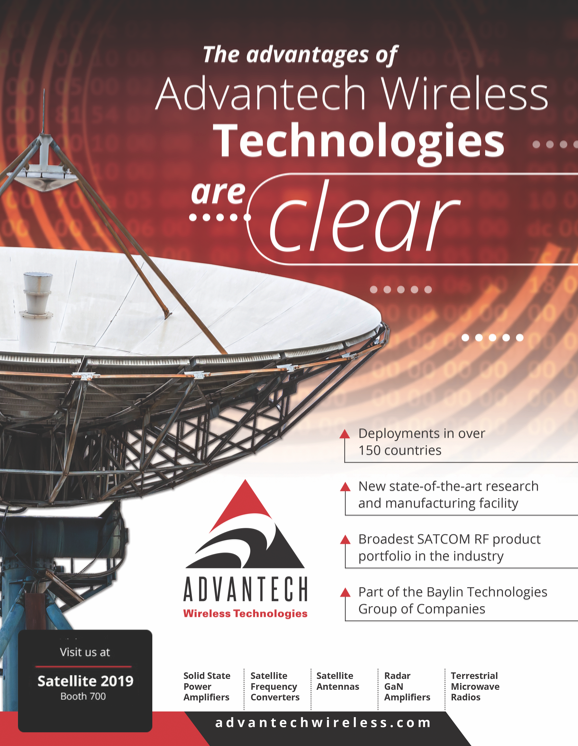 With the continued successes of fielding the current generation systems — most recently the fourth Advanced Extremely High Frequency (AEHF-4) satellite in October of 2018 and the tenth Wideband Global SATCOM (WGS-10) satellite in March of 2019 — the entire SATCOM enterprise (military, commercial, and international partners) is transitioning an integrated architecture that is more robust, resilient, flexible, and capable of fighting through a contested, degraded, and operationally-limited (CDO) environment. 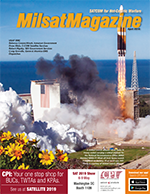 A major step toward this new architecture is to implement a disaggregation strategy in the military satellite communications (MILSATCOM) space tier to improve resiliency while maintaining backward compatibility. The AEHF satellite constellation, in concert with its predecessor, the Milstar system, currently provides both protected tactical communications and strategic, nuclear-hardened communications for the President and other decision makers. The next-generation of space systems disaggregates the AEHF strategic and tactical SATCOM missions into the Evolved Strategic SATCOM (ESS) and Protected Tactical SATCOM (PTS) programs, respectively. This disaggregation improves resilience by reducing inherent single-point-of-failure vulnerabilities associated with multi-mission satellites while also providing increased architectural flexibility via payload hosting opportunities. Dedicated “free-flyer” satellite solutions are also subject to fewer technical trade-offs that may marginalize mission-specific capability in order to accommodate a multi-mission satellite design. The ESS program will deliver the next-generation continuation of the Nuclear Command, Control and Communication (NC3) mission, replacing the mid-latitude AEHF system capability and extending the survivable communications capability to the North Polar Region. This program will also satisfy emerging requirements for enhanced resiliency to meet the challenges of the future. 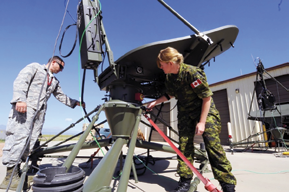 The PTS program is the space component of the Protected Anti-jam Tactical SATCOM (PATS) architecture for bringing improved protection, capability and affordability to warfighters worldwide. PTS will be a constellation of distributed hosted payloads and free-flying satellites that will provide higher anti-jam protection and increased capacity compared to current systems. The PTS payloads will be capable of processing the Protected Tactical Waveform (a government-owned waveform that enables enhanced, protected communications) on-board to provide anti-jam SATCOM to joint warfighters in anti-access/area denial environments. The Protected Tactical Enterprise Service (PTES) is the ground component of PATS for controlling and managing the components of the network. Recently awarded, PTES is implementing an innovative prototyping approach to provide Protected Tactical Waveform services over WGS satellites in the Pacific Area of Responsibility by 2022. 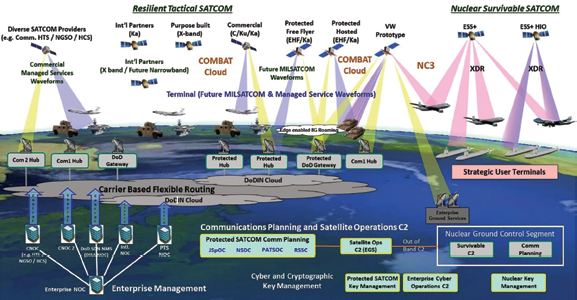 With the demand for tactical communication capability in the North Polar Region expected to expand to meet the growth of U.S. and Allied activities, the Enhanced Polar System-Recapitalization (EPS-R) program provides assured, anti-jam, and low-probability of detection, low-probability of intercept satellite communications to tactical users above 65 degrees North. EPS-R will deliver a 26x capacity increase over the legacy Interim Polar System. The USAF is collaborating with respective allies on a hosted payload solution for the system that will result in substantial cost avoidance for the U.S. and will also close a capability gap three years earlier than if acquired as dedicated satellite. The agreement will provide U.S. warfighters Arctic X-band resources – a first ever for the U.S.
U.S. Air Force Space Command (AFSPC) Commander General John W. “Jay” Raymond’s vision for SATCOM is that AFSPC provide an operationally effective, affordable, resilient, and secure satellite communications architecture that supports global mission priorities and is adaptable to rapidly changing requirements, technologies, and threats. The key building blocks for achieving Fighting SATCOM are a management and control framework to coordinate assets/tasking, flexible terminals that can operate in military platforms/environments, flexible networks to rapidly restore network connections as well as a diverse pool of space assets to provide path redundancy and operational flexibility such that as the operational environment evolves, the flexible terminals can “roam” across multiple waveforms, bands and other elements of the architecture including commercial and international partner systems. 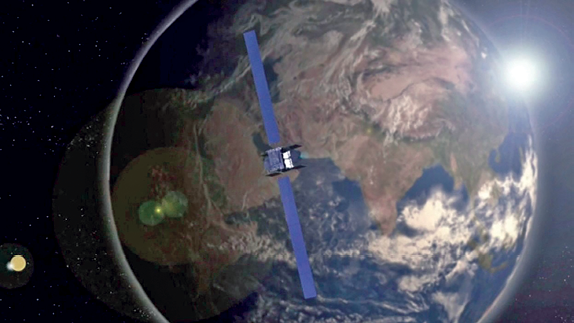 On December 12, 2018, AFSPC assumed sole responsibility for the procurement of commercial satellite communications (COMSATCOM) services for the Department of Defense (DoD) by transitioning the COMSATCOM bandwidth leasing functions into AFSPC and establishing the Air Force Commercial Satellite Communications Office (AFCSCO). These functions were formerly executed by the Defense Information Systems Agency (DISA). This consolidation of MILSATCOM and COMSATCOM procurement authority enables AFSPC to deliver better-integrated solutions consistent with General Raymond’s vision. 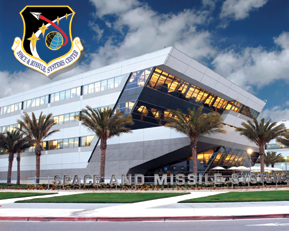 The USAF’s Space and Missile Systems Center (SMC) is furthering the advancement of Fighting SATCOM by awarding development contracts for enterprise management and control prototypes to members of the Space Enterprise Consortium, a team of industry leaders, academic research institutions, and innovative early-stage and start-up companies working together to develop next generation space technologies. Prototype solutions will demonstrate key attributes required of the enterprise to include rapid, resilient, sustainable and global access to SATCOM capabilities; terminal, modem and network agility; cyber, link and operational security; and data interoperability with joint command and control systems. This year’s prototyping efforts are focused on delivering situational awareness capabilities and providing a common operating picture that assists users in conducting enterprise SATCOM planning, brokering, and orchestration functions. These prototypes will be important steps toward defining the architecture, conducting risk reduction, and identifying early technologies and capabilities that can quickly be transitioned into operations. Defining the enterprise architecture will allow future programs and capabilities to quickly and seamlessly integrate with legacy systems while bringing together the full spectrum of SATCOM service capabilities. AFCSCO will pursue enhanced models for acquiring, delivering, and integrating dynamic COMSATCOM requirements into the SATCOM enterprise. Transforming COMSATCOM in this manner will ensure global readiness and on-demand access to a variety of COMSATCOM capabilities at any time, support roaming between systems, and leverage the DoD’s collective buying power. AFCSCO will acquire tools to enable near-real-time access to business and requirements data to improve planning and dissemination of mission data. up an Air Force Ground Multi-band Terminal (GMT) antenna. Photo is courtesy of U.S. Air Force/2nd Lt Darren Domingo. AFCSCO will also provide a foundational trial of COMSATCOM managed services to evaluate details of technical and operational risks and opportunities. Terminals pose a particularly vexing challenge given the broad diversity of SATCOM terminals currently in operation (17,000+ terminals procured by approximately 135 terminal programs). SMC’s SATCOM Pilot Phase 2 effort successfully prototyped and demonstrated terminal flexibility. These demonstrations modified legacy terminals by inserting preloaded configuration files that enabled roaming between different SATCOM services. This effort also developed interface controls and standards for the Government’s enterprise management and control functions, SATCOM service providers, and flexible terminals. In addition to these efforts, the USAF has conducted extensive workshops that continue to garner enthusiastic participation from this broad community of users, industry, and other DoD stakeholders to move toward standards for future interfaces. Disruptive technologies also look to play a significant role in the future of SATCOM. Several commercial providers are aggressively pursuing SATCOM solutions comprised of many small satellites in Low Earth Orbit (LEO). This presents an attractive opportunity to access orders of magnitude increases in bandwidth capacity, but is potentially hampered by the lack of available phased array terminal antennas. Unlike traditional dish antennas, phased array antennas are capable of tracking and receiving signals from fast-moving LEO satellites without the need to mechanically point them at the satellites. Accordingly, maturation of phased array antennas for mobile use looks to be a significant source of influence in its own right. Laser crosslinks present interesting possibilities in their ability to facilitate rapid transfer of massive amounts of data among space assets, improving resiliency. Additional advancements poised for significant impact on SATCOM include mesh networks and exploiting new spectrum regimes. A mesh network is a network topology where each node is capable of relaying data and effectively acting as an independent router, a concept that could be leveraged broadly in an integrated SATCOM architecture. Ongoing experiments exploring applications for using various frequencies are introducing opportunities to drastically increase bandwidth capacity for SATCOM applications. In addition to the consolidation of MILSATCOM and COMSATCOM procurement authorities, AFSPC is taking steps to reduce delivery timelines by aggressively seeking efficiencies and leveraging new statutory authorities. SMC is almost six months into implementation of “SMC 2.0” —– an overhaul of its structure and processes aimed at acceleration by creating an action-oriented decision framework, fostering innovation, cultivating partnerships, embracing an enterprise mindset, and creating a culture of continuous improvement. Section 804 of the FY16 National Defense Authorization Act created authorities for a middle tier of acquisition for rapid prototyping and rapid fielding. These authorities provide expedited decision gateways for prototyping (use of innovative technologies to rapidly develop fieldable prototypes to demonstrate new capabilities and meet emerging military needs) and fielding (use of proven technologies to field production quantities of new or upgraded systems). The ESS, PTS, and PTES have adopted new Rapid Section 804 authorities. In executing direction from Congress, the USAF is also leveraging commercial technologies and practices in procuring the eleventh satellite for the WGS constellation (WGS-11). This satellite improves upon the capabilities of the recent WGS satellites by providing a two-fold increase in capacity and bandwidth, improved resilience with more beams, enhanced coverage, better anti-jam performance, and enhanced flexibility and performance to better serve warfighters. Furthermore, SMC’s Chief Partnership Office continues to forge groundbreaking agreements on the WGS and AEHF programs with a group of ten international partner nations. These partnerships, and the nascent relationship with Norway on the EPS-R program, represent a promising path toward greater international cooperation. By developing a wide network of Allied, interagency and commercial partnerships, the Air Force can share costs, move faster, and deliver Fighting SATCOM that is more interoperable, resilient and cost-effective. An integrated SATCOM enterprise delivers unparalleled options to joint warfighters for mission success. Compared to today’s collection of stove-piped SATCOM systems, the enterprise will deliver the performance and resilience necessary to address a 21st century contested space domain. The USAF is accelerating delivery of this enterprise to ensure warfighters receive the operational benefits of SATCOM effects in CDO environments and is embracing faster acquisition processes and faster command and control constructs to maintain the advantage in any conflict. Delivering Fighting SATCOM for warfighters will be a major step toward maintaining U.S. SATCOM dominance on the battlefield.